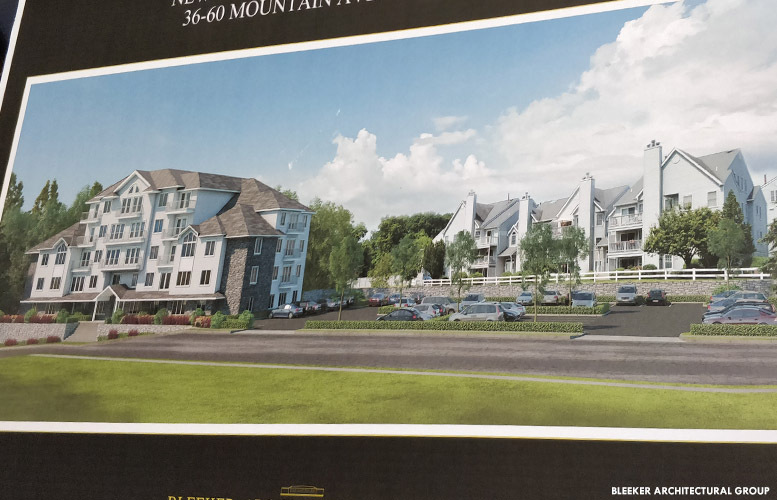 The city rejected a proposal to construct a 42-unit apartment complex for “high-end” luxury housing on Mountain Avenue, close to the Garret Mountain Reservation, following staunch opposition from residents and neighboring Woodland Park on Monday night. Two dozen people, including a dozen from the Garret Heights, attended the Paterson Planning Board meeting to oppose the new development. “It’s just too big a project for that area,” said Joyce Corbo, who owns a condominium at the Garret Heights. She and other opponents of the project cited potential traffic, parking, and fire safety problems. The developer, Garret Manor LLC of New York City, is providing the required 80 parking spaces – 12 spaces underground and 68 at a surface lot — for the development. Opponents attacked the “tandem parking” proposal mentioned in the application. Garret Manor needed a waiver from the city to have 24 tandem parking spaces without an attendant at the site. John Bleeker, architect for the developer, said the building would have a superintendent, who would live at the development. “We’re very cognizant of the parking concerns,” said Jason Bauer, one of the partners in the project. Bauer’s team never met with the opponents of the project. An attorney, Albert Buglione, who represented Woodland Park at the meeting, slammed the developer for failing to meet with the objectors. Buglione suggested Bauer’s statement was disingenuous. Opponents also criticized a traffic analysis conducted by the developer. Buglione and others slammed the developer’s traffic engineer for visiting the area hours before the meeting. The traffic engineer testified he canvassed the area in his vehicle. The attorney undermined the traffic study before the board by asserting the traffic engineer never got out of his vehicle. The traffic engineer said his team, though without him, visited the site multiple times to conduct the study. Early on in the meeting, Buglione hinted at a possible court appeal. Keith Kazmark, mayor of Woodland Park, told the board the proposed building does not fit in with the character of the neighborhood. The development at 36-60 Mountain Avenue is close to the Paterson-Woodland Park border. Kazmark said he worried about a fire at the rear of the building and the difficulty engines would have in getting into the development. He said the two Paterson fire houses, Temple Street and Madison Avenue, are far away from the proposed Garret Manor. Except, the new Stony Road Firehouse is five minutes away on McBride Avenue. The city’s fire department did not object to the developer’s application. The two sides could not agree on a set of facts. For example, some of the opponents said the “tandem parking” will be on the side of the street, when in fact, the site plan shows it inside the parking lot of the building. Opponents badgered the developer over inconsistencies. There was confusion as to whether the building would have assigned parking spots for tenants. A clear answer was never provided. Kazmark’s testimony swayed the board to reject the application in a 5-1 vote. Chairwoman Janice Northrop abstained. The developer sought to construct a 5.5-story residential complex. First and second floors would each have 10 apartments. Third floor would have 10 and fourth floor would have eight. And the fifth floor would have 4 apartments. 18 would be one-bedroom and 24 two-bedroom units, according to municipal records. Bauer described the apartments as “high-end” with many amenities. Rents would range from $1,800 to $2,000 for a one-bedroom apartment at the complex. Alan Mariconda, attorney for the developer, said his client will seriously look at appealing the denial with the New Jersey Superior Court.